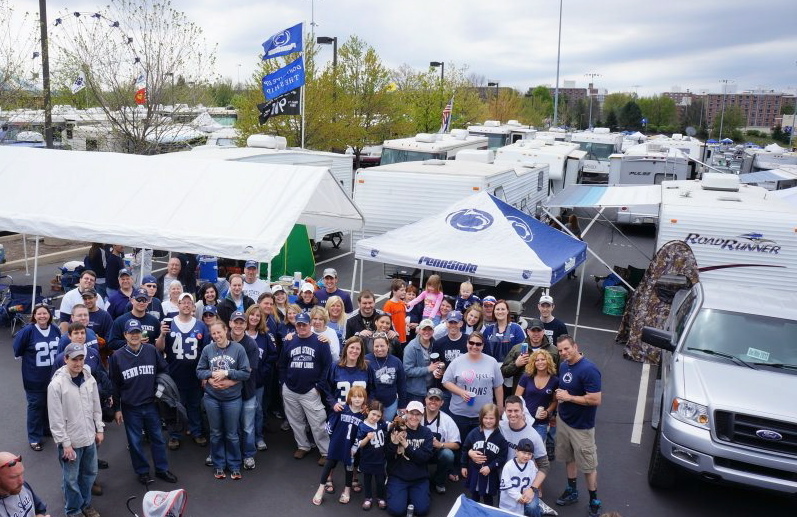 Blue White 2012 - It was the worst of times; it was the best of tailgates. Our day on Saturday (PSU Blue White game) did not start out in a Happy Place. We had arrived at the stadium a little before 8am - and yet we were not set up until well past 9am. But, for as frustrating and annoying as the early am was, it ended up being a fantastic day - and a great tailgate. We deviated from our traditional theme of "practice" for Blue White this year. With the events of the past fall and winter, we decided that a fitting theme for this year would be Irish Wake. We would celebrate the passing of our dear Coach, with some Italian favorites, while welcoming the new guy with some Irish classics. And then some. So that meant a bevy of irish and italian inspired dishes. We had traditional Lasagna and corned beef with potatoes (okay, the corned beef was a little unique, we cooked it in guinness - a reoccurring ingredient) and some fusion items like chicken florentine pasties. First, I made homemade chicken stock - with roasted chicken bits, guinness and water. Next, the wings (3-4lbs drummettes and 2 prongs) were baked in a pre-heated 450F oven for 45 minutes, and turned once. While the wings were baking, I reduced the chicken "stout stock" over medium heat and added more guinness, dried spices (cinnamon, paprika, ginger, garlic, onion powder, sea salt, pepper) and sliced jalapeño peppers (1-2 seeded peppers) - and, at the very end 1-2 tablespoons spicy mustard and a handful (about 1/3 a cup) of brown sugar. Once the wings were out of the oven, we transferred them to foil baking dishes and covered them with the reduced stout sauce. Because we like to plan ahead, the wings were then frozen. At the parking lots, we rewarmed the now thawed wings in a pan on the propane stove, we added 1/2 a cup (or so) of prepared jerk sauce (we used wegmans brand) and... more guinness! I'll admit, I was a little nervous about the end result - but they were great and I'll definitely be trying them again!